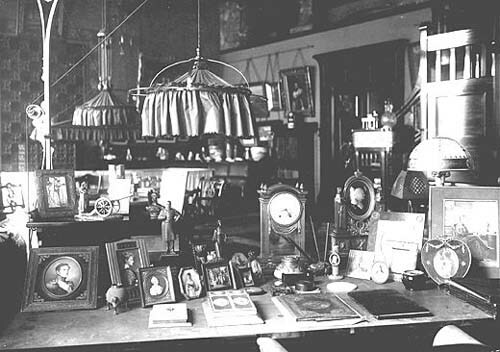 Above: Nicholas's desk in the New Study. "I am writing theses lines 20 years after Nicholas's II death. I had enough time to analyse everything that had been going on in my presence and I am convinced that Nicholas II never wanted to do harm to anyone, to say nothing of the whole country. But there were certain things that were not known to him. Perhaps the Tsar did not possess a strong will. It was especially felt at the moments when it was necessary to take decisions - listening to the opinions of others he could not insist on his point of view. ...His family made his position even more difficult. Though the Tsar was considered to be its official head he was not its eldest member. The throne passed directly from father to son and it often happened (as in the last reign) that the young monarch found himself surrounded with uncles, cousins and other relatives who were elder than him and more experienced. They used their position in the family to influence the Emperor but in spite of that the Russian Emperor was considered an autocrat and he could not share his responsibility for the country, at least moral, with anyone. In that atmosphere the Emperor preferred to shut his eyes on the matter rather than to fight for his point of view or at least insist on it. That trait of his character that he developed under the circumstances was an inferiority complex of a kind but now many explain his complaisance by the fact that he had followed advice of others obediently as he had sincerely believed that they were right. I think that Nicholas's II early years and the way he was brought up bred a feeling of diffidence in him. In his childhood and youth Nicholas II was influenced by his father who possessed a strong will-power and a great physical strength. Nicholas II started his military career as a junior officer. A foreign reader can hardly imagine that in Russia of those days he was treated equally with all the other junior officers; he had no privilege in following the rules and he was "persecuted" as all the other freshmen. To give his son an idea of how the government worked Alexander III introduced him into the circles of the most outstanding political figures and the famous people in the law sphere. And it's quite understandable that the heir was put down by their knowledge and experience. Such were the conditions under which Nicholas II who had not yet even become a commander of a regiment in his military career, had to take the burden of ruling the country who was the biggest empire in the world." The New Study was built in 1902 by Roman Meltzer in a major project to enlarge the living quarters of the Imperial family. Two large rooms, the Maple Room and the New Study were built on opposite sides of an extension of the corridor, but with a lover ceiling to accommodate a mezzanine level which connected the balconies of these two rooms. The first impression many people had of the New Study was that it reminded them of a ship. The walls and ceiling were covered with highly polished mahogany set with bright brass fittings. The walls were painted a light green with a stencilled pattern over an arch behind the Tsar's desk and also one surrounding the fireplace of pine branches with cones. A number of unusual chandeliers hung on uneven chains from the ceiling. They were made of beautiful art glass and gilt bronze. Across the entire room stretched a balcony with gray Austrian marble columns set with gilt bronze mounts. A mahogany staircase led to the top of the balcony, it wrapped around a built in sofa and fireplace. Flamboyant Art Nouveau fabrics from Liberty in London were used for the curtains and to upholster the furniture. The curtains were heavily lined and luxurious All of this was built in Jugendstil style and was definitely inspired by current innovations in design taking place there under the patronage of Alexandra's brother Grand Duke Ernst-Ludwig. On one wall was built a large ceramic fireplace with dark gray tiles. A marble bust of Alexandra stood on top of the mantle. To the left of it hung Kaulbach's study for his large portrait of Alexandra in the Formal Reception Room, which was Nicholas's favorite portrait of his wife. Further left was a door leading towards Nicholas's dressing rooms and the room of his valet. Above the door was a large painting by Mayakovsky of children at play. Left: The round table in the New Study. In the center of the room stood a big round table surrounded by Chippendale-style chairs. Council of State meetings were held here. Alongside was a huge billiard table. Nicholas and his nephew, Grand Duke Dmitri, used to frequently play pool here. Nicholas and Alexandra thought of Dmitri like a son and they were deeply shocked when they discovered he was involved in the murder of Rasputin. The Tsar and Tsarina were frequently disappointed in people who they trusted and relied on. They were often poor judges of character and mistook insincere and self-serving courtiers for faithful friends. Nicholas had bad relations with most of his family and this became worse as time went on. There were many issues which divided them. Rasputin's supposed influence was one issue. The Romanov family felt leaderless and did not have faith in Nicholas's abilities. They thought he was totally dominated by his wife, who did not hesitate to say what she thought about the Romanovs, their lack of principals and spoiled self-importance. At the end of his reign virtually the entire family was in rebellion and was plotting to murder Alexandra and replace Nicholas with his brother. Although the issues of Nicholas's leadership abilities are understood to have been the primarily reason for this dissatisfaction with the Tsar anti-Semitism in the Romanov family was also a factor. Anti-Semitism was common throughout Europe and America in 1900. Many politicians and heads-of-state of countries like England, France and the USA expressed anti-Semitic sentiments. This reflected the bias of the population at large. Russia was no different. In some countries anti-Semitism was more virulent than in other places. Russia was an extreme example. The only country to take a consistent stand against anti-Semitism was America, which went so far as to cancel its' economic treaty with Russia in 1911 due to the denial of basic civil rights to Jews within the Russian Empire. It had been expected that reforms promised in 1905 would have lead to civil rights for the Jews in Russia, but this did not happen - in large part due to the opposition of the right wing - and Nicholas's government's alliance with these parties. 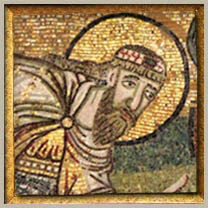 Nicholas was also personally opposed to Jewish rights at the time. His opposition continued until September 1916 when Nicholas's government, on the personal innovative of the Tsar and his minister, Protopopov, endorsed full civil rights for the Jews. The Progressive block in the Duma welcomed this move, which Kerensky called one of the few positive actions of the government at the time. 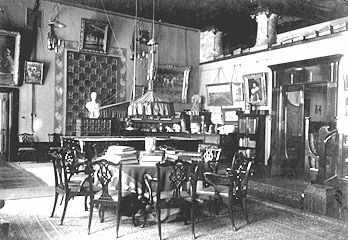 Above: The area to the left of Nicholas's desk in the New Study. 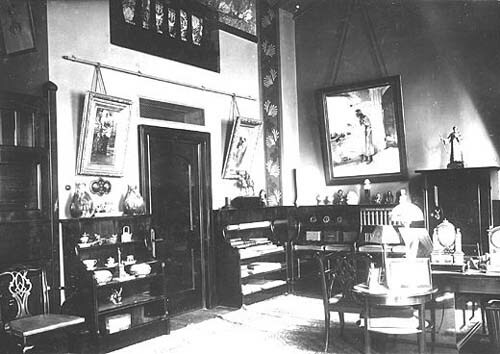 The cabinet on the left contained rare pieces of porcelain. The cabinet on the right held papers and books. This plan was discussed throughout the fall of 1916. It caused enormous controversy in the right wing parties, the Army and in the Romanov family, which were all strongly opposed to the government's intentions regarding the Jews. In November 1916 reports of the existence of draft legislation which the government planned to submit to the opening of the new Duma on February 28, 1917 circulated. Since the fall of 1916 the Romanov family, with the support of right wing elements and army generals, was actively planning the overthrow of Nicholas II. These actions even had the support of Nicholas's brother, Mikhail. These efforts took real form in December 1916 when members of the family, in partnership with a right-wing member of the Duma, assassinated Rasputin. Nicholas's wife Alexandra was next on the list to be eliminated. ".... To sum up: One can expect no good from Tsarskoe and the question is therefore the following: either to sit back with folded arms and wait for the ruin and humiliation of Russia, or to save Russia by taking heroic measures. The situation is without issue, and such as Russia has never experienced before, and so people who love Russia find themselves at a cross roads and wonder how to act; for the first time in our lives, we have to ask how far we are bound by the oath given. In all, it's a nightmare, from which I can see no escape. As for D.P. [Dmitri Pavlovich] and E [Felix], everything is going as I supposed, in a few days it will all be over and consigned to oblivion. In my conversation with A and N, I also touched on two subjects, which have been raised by Protopopov, the expropriation of landowners' land in favour of the peasants and equal rights for the Jews. It's typical that Alix did not voice any protest on these questions, while he objected to the first and then appeared confused about the second, replying that it was equality only in the sense of a widening of the Pale of Settlement; I protested as strongly as I could, saying that concessions or new rights for the Jews were unthinkable, that we could not afford to be merciful to a race which the Russian people hate even more now because of their negative attitude towards the war and outright treason; it was noticeable that Alix didn't protest, obviously such projects do exist." Alexander omits any reference to his opposition to the Jewish legislation in his American book - after all, such sentiments would have been badly received in the USA. Why did Nicholas II change his mind on civil rights for the Jews between 1905 and 1916? There is strong evidence that his attitude changed over time. First, he was never the rabid anti-Semite that many in Russia were at the time. He was certainly less so than most members of his family and he was castigated for this by them. There were two factors that changed Nicholas's mind toward the end of his reign. One of them was WWI. During the war Nicholas saw hundreds of thousands of his country men die - many more were wounded. They came from all class and religions. Jews were persecuted in the Army but WWI and the lack of men lead to a loosening of these restrictions. Among the troops was a Jewish soldier who had returned from America to fight for his country, who was severely wounded and made an invalid. After his recovery this man wanted to move to Moscow where he could hope to make a living, but this was not allowed because he was a Jew. This man's petition reached Nicholas and Alexandra who discussed the man's plight and the ridiculousness of the laws regarding the Jews and the Pale of Settlement. This incident created a change of heart in Nicholas in 1915. Personal experience with real-life stories like this one often lead to change. Also, we know that Rasputin was a strong advocate of granting full civil rights to the Jews. Rasputin's Jewish secretary claimed after the revolution that he was the one that lead Rasputin to push for this. It now seems clear that this is one of the reasons Rasputin was killed by members of the Romanov family and a right-wing member of the Duma in December 1916. Throughout the last months of the dynasty the army and the Romanov family, with the tacit approval of Duma leaders, continued to conspire for the overthrow of Nicholas. This happened just prior to the projected opening of the Duma when the legislation was to have been presented. Fear of this legislation was not one of the primary causes of the revolution, but it is reasonable to believe that the removal of the support of the Romanov family and the army at the time was caused, in part, because of it and this was also one of the factors which lead to the murder of Rasputin. Nicholas II was anti-Semitic, perhaps less so than most Russians, but this changed late in his reign. Therefore, to be fair to Nicholas II we should acknowledge his change in policy and in his own convictions. It would be a curious turn of events if it were recognized that one of the factors in his downfall was his support of Jewish civil rights.